Family Christmas Eve dinner this year (it is our big day as we do presents after dinner) was Asian appetizers. I was tasked with spring rolls! Now, I didn’t go super traditional (we do have selfish allergies after all) but judging by how quickly they were consumed, no one in my family cared. Now spring rolls are not difficult, just time consuming and a bit tedious. You have tons of chopping and prep work to do. 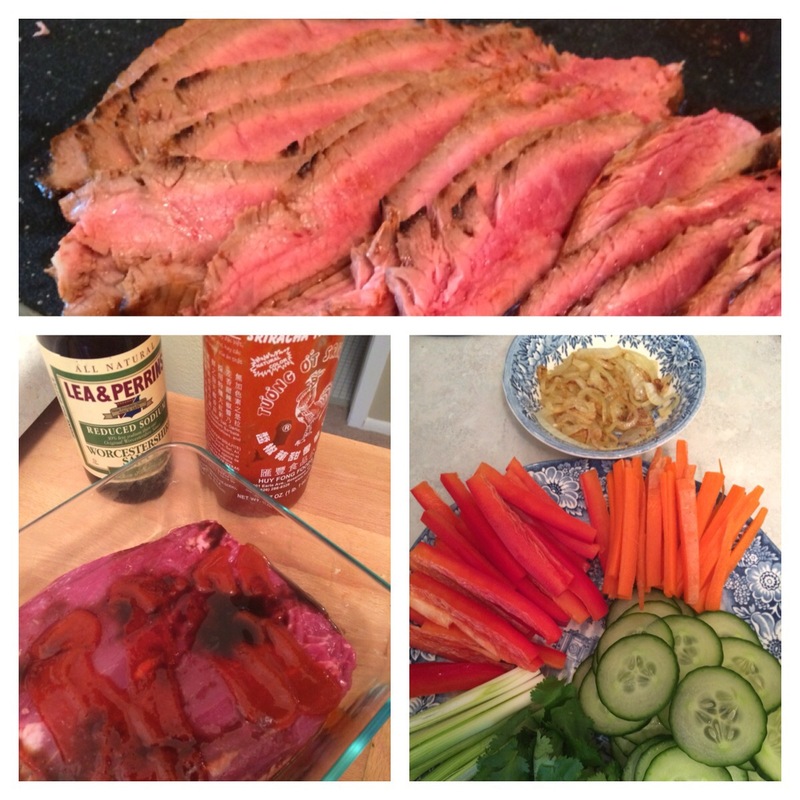 I started the flank steak in the marinade first thing in the morning and didn’t cook it till about 1:30 (pm). You can marinate longer or just half an hour, depending on how much time you have. I also made the sauce in the morning, just to get it out of the way. Betty tip! Make sure to take the time to really THINLY slice everything. Thicker slices are more difficult to assemble and to eat. Plus then you get only one flavor in each bite and that is not the point of spring rolls. Now I didn’t really measure, just coated both sides in Sriracha and then poured some worschestetshire sauce over the top. 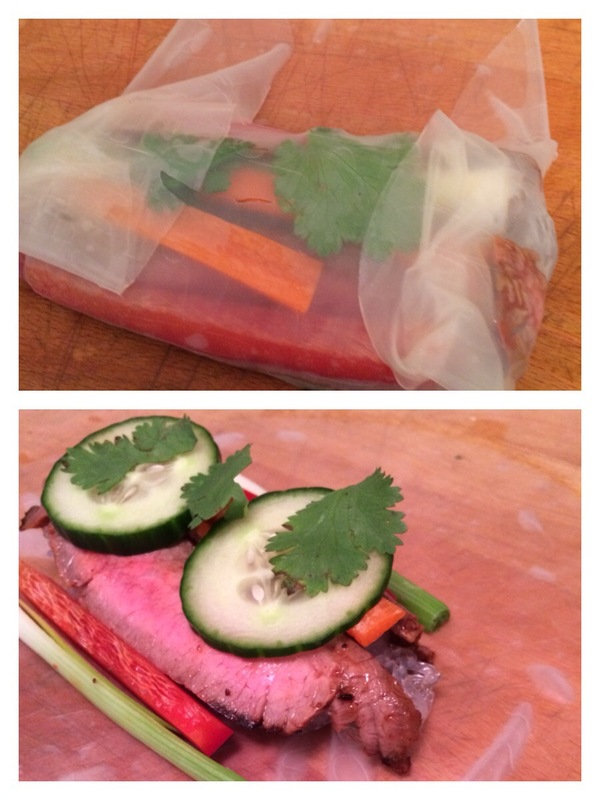 I marinated it in the fridge for a few hours and then removed from the fridge about half an hour before cooking. You could grill this (5-6 minutes a side) but I simply seared mine in a cast iron on medium-high for 7-8 minutes a side. Let the meat rest for about 10-15 minutes before slicing. I aimed for about 1/8 inch on the slices. Mix all ingredients together and done! Prep is KEY. I like to put all the veggies on one tray, the steak on a separate tray, and have a pan full of warm water right next to the cutting board. I like to use my wooden cutting board as my assembly board, just because of where it is located in my kitchen. First step, soak the spring roll wrapper in the warm water till it is softened. This takes about 30 seconds so pay attention. Gently remove from the water and let the excess drip off before laying it flat on the assembly surface. I typically start the roll with either the noodles or the cucumber, just makes a good base. Next add a few pieces of each vegetable and 1-2 slices of meat. You wrap them up a lot like a present. Starting with the edge nearest you, fold this up over the filling. Then tuck up the edges. Making sure to pull back towards you lightly (to keep the filling compact) finish rolling the wrapper up. I roll away from myself at this point. Repeat, a lot. The ingredient amounts listed will make about 15 rolls. I made half of mine without the bell pepper and added caramelized onion, also delish! Now I don’t have finished images, sorry but they were too good and I forgot! But if you really need to know how it look in the end, ask the Google. Google knows everything.